Meet Martín Albarrán! 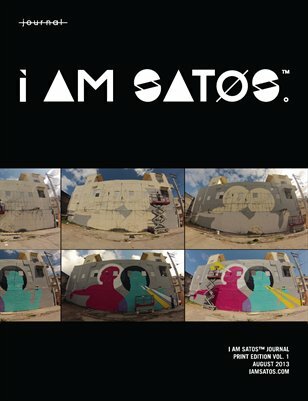 Martín Albarrán is an artist based in San Juan, Puerto Rico. His preparation in the art and design worlds ranges from sculpture, restoration and architecture. Martín has been educated in art since high school at the Escuela Central de Artes Visuales in San Juan, PR and later received a bachelor in fine arts with concentration in sculpture from the Escuela de Artes Plásticas de San Juan. He became a sculpture professor at a the same school, and later spent four years at a restoration workshop working with crafts and antique furniture. Alongside artist Filipo Tirado he had a workshop at Santurce for the production of sculptures. From 2007 to 2010 he started coursework in architecture at the graduate program of the School of Architecture at the University of Puerto Rico. It was during an academic exchange at Barcelona, where he became involved in digital design and contemporary architecture history, that his vision about spaces transformed from space for exhibition to places for creation. From this vision, La Productora, his latest endeavor into art entrepreneurship emerges. La Productora is not only a space for producing art, it is as Martín describes it: “a space for producing culture; a space to revitalize and echo the constant movement in the Cerra street at Santurce”. Our collaborator and artist Fortunato-Velázquez, sat down with Martín at La Productora to chat about his experiences and undertaking as an art entrepreneur. You describe La Productora as an “alternative space where art and design converge”. Where did the idea of creating an alternative space for contemporary art emerge? The idea comes from Cart Watch, a previous production and exhibition space which is the inspiration for developing this second project. The space had a good reception by the artists, which were motivated to produce for the space. There were times when the artists wanted to show work and they presented the idea of an exhibition to my partner and me. Initially we came to the space with the idea of a studio for fabrication of any kind of objects. With time, alongside sculptor Jaime Rodríguez, we realized its possibilities for developing a space for artistic production and exhibition. We explored what to do with the space, what message we wanted to express and what type of audience to bring. After that project I was left wanting a space that would more closely approach the professional side of art. With this new space, we want to bring artists with some kind of experience or those who are working with an established perspective, but who don’t have a space or support from a particular space. My goal is to give the space an ample promotion, not only to create a hangout place like it occurred in my previous project, but also change the perception of the interior space so that art stands out. How do you identify yourself with autonomous management? What is the role for starting this enterprise? I coordinate everything that is going on in the space, and Roberto is more concerned with his work as a designer. I look for contacts and establish the networks. I look for the artists and the curators, so I don’t always have the role of curator and instead the vision of the space varies and expands with exhibitions that have not made it to museums or galleries. We want to provoke that the artists that already have a trajectory bring in proposals for exhibits. I want the artist to bring in ideas and to market those ideas, with a concept that holds the work sample as a whole. I want the artist to bring me the undertone of his/her process, for me to be able to understand it and be able to emphasize the importance of the work beyond the aesthetics. What is the differentiation of this space in comparison with other spaces that are emerging in the contemporary art scene? Other spaces are more formal; they have scholarships and monetary support. We are based in autonomous management, and whatever money we receive is invested back to the space. In this aspect, La Productora is less formal; we don’t interview the artist to be able to produce here. We do have criteria for selection, but at the same time we are very flexible so that the artist who is looking for an alternative space for creation can actually develop. We would like to achieve a point were we could bring lectures and international artists. I hope we can do it at some point so that the space can transcend. I would like to start seeing here what is being created outside the Island. Do you think there has been a transformation of the mentality about art? In that case, does the space emerge as a response to it or critique about the absence of it? What is your vision for the development of the project in short term and long term? What situations in the future would enable the project to go forward? I want more artists to come to the studio spaces and that those artists stay as residents in the space. Maybe create some type of critique cycles were we could bring people from the exterior and include them in the creative process, which at the same time would enrich the studio experience with other perspectives. I want to establish an itinerary and keep bringing to the space quality work; maybe create a lecture cycle. It is not about creating exhibitions just because; it's about maintaining a sequence from an artistic logic. I want the space to become a residency for artists. At the same time I want to have the opportunity to take the work and artists to the exterior. Tagged with INTERVIEW, ART, PUERTO RICO, LA PRODUCTORA. April 23, 2013 by Pedro Fortunato Velázquez. Meet Anabel Vázquez! Anabel is an artist and curator based in Boston, MA. It was an unexpected but great surprise to have met her in Milledgeville, GA at the Georgia College Museum where her art and co-curatorial work Carry-On: Puerto Rico Inspected is being exhibited. The day before the opening and with the exhibition set-up in the background, I had the chance to sit with Anabel to talk about her trajectory. Boston is Anabel’s home since 1998, when she transferred from the University of Puerto Rico to Mass Art (Massachusetts College of Art and Design). The creative atmosphere she encountered at Mass Art, alleviated the cultural shock she felt in her transition from Puerto Rico. At Mass Art she majored in photography with a minor in film, skills she masters in her practice by mixing photography with painting and film. Anabel’s move to Boston coincided with major political and social clashes in Puerto Rico such as a general strike provoked by people’s unrest about the privatization of the telephone company, and the struggle against the U.S. Navy’s military presence in the island-municipality of Vieques. Looking at these situations from a distance and immersed in another culture, made Anabel realize and value the unique combatant nature of her people back in Puerto Rico. The social atmosphere after September 11 also had great impact on how she saw people feel and act in her surroundings. In 2002, for the commemoration of the anniversary of 911 she was invited by legendary avant-garde filmmaker Saul Levine to participate in a one year anniversary 911 show that he curated at his weekly show Massart Film Society. Soon after she was inspired by the other artists and their work in the 911 show, and invited some of them to be part of her first series of monthly multimedia shows at the Zeitgeist Gallery in Cambridge, From the first show, Kill The Body And The Head Will Die, the core of Esprit de Corps Art collective was conceived. Focused on political art and in mixed media, Esprit De Corps Art Collective traveled to many cities to share the message. The collective was an international mix of people reaching 15 artists at a time, being Anabel the only Latin American. At this point it became very important for Anabel to continue her work in Boston. for spreading the word about what is going on in Puerto Rico and make the connections with the activism in the U.S. Since then she has done many curatorial work focused on exchanging cultural values through art. For this she has brought international artists to Puerto Rico, as well as Puerto Rican art to other international cities. Discordia Films, is one of the curatorial projects in which Anabel collaborates with Argentinian and Chilean colleagues for showing international films through tours around South America, North America and Europe. Anabel currently works in different contexts: as digital archivist of antique collections at the Boston Public Library; manager for a film professor; and also frames exhibitions. Living at one of the most expensive cities in the U.S. requires great sacrifice, reason for which Anabel considered moving back home to continue graduate studies. This plan was abruptly stopped when a curator position at La Galería at Villa Victoria Center for the Arts, a program of Boricuas Inquilinos en Acción. Inquilinos Boricuas en Acción is a non-profit organization that serves low-income communities in Boston, mainly Puerto Rican communities. This organization’s history goes back to 1968 when a group of Puerto Rican activists came together to take control over the displacement of their neighborhood. With this organized effort by the community, Villa Victoria was approved and the government of Boston granted the land. Anabel has been the curator since 2010 of La Galería. Through this position she has been able to bring Puerto Rican artists to Boston, and more recently invite Beto Torrens to co-curate Carry-On: Puerto Rico Inspected. Tagged with ARTISTS, EXILE, INTERVIEW, EXHIBIT, ART, PROFILE. April 8, 2013 by Mariana Ortiz-Reyes.